These are the contexts of the quotes tweeted from @sueannbowling between December 5 and December 11, 2013. 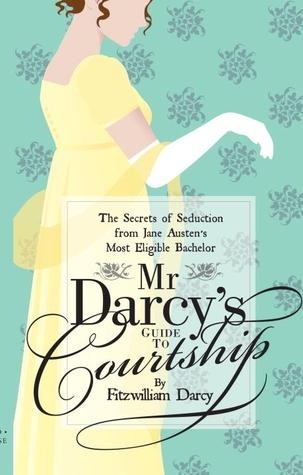 Those from Mr. Darcy’s Guide to Courtship were tweeted as if Mr. Darcy were the author. “In such cases as these, a good memory is unpardonable.” Pride and Prejudice, by Jane Austen. Elizabeth is speaking to Jane for the first time about her change of feelings and engagement to Darcy. 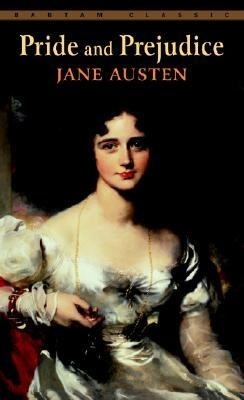 “Do anything rather than marry without affection.” Pride and Prejudice, by Jane Austen. Part of the same conversation of Jane with Elizabeth, Jane speaking. “These violent young lovers carry everything their own way.” Pride and Prejudice, by Jane Austen. Mr. Bennett, after he realizes what Darcy has done for Lydia. “I have no inclination to expend effort on those who have not taken the trouble to learn to read.” Mr. Darcy’s Guide to Courtship, by Emily Brand. As a writer, I have to agree with Mr. Darcy here, though of course he did not have access to audiobooks. “In plain words, there should be no ‘falling in love,’ except with suitable persons.” Mr. Darcy’s Guide to Courtship, by Emily Brand. Clearly Darcy wrote this before he met Elizabeth! “No sense staying in bed.” Tourist Trap, by Sue Ann Bowling. Penny’s thought when she wakes while Roi and Flame are still asleep. These are the quotes tweeted from @sueannbowling from November 7 through November 13, 2013. All but the first are from Pride and Prejudice, by Jane Austen. “Angry people are not always wise.” Caroline Bennett persists in making unfavorable comments about Elizabeth, which are not advancing her case with Darcy. “If she heard me it was by good luck, for I am sure she did not listen.” Elizabeth’s Aunt Gardiner in a letter to her neice mentioning Lydia’s behavior before her marriage. “We all love to instruct, though we can teach only what is not worth knowing.” Elizabeth to Jane, who has been trying to convince her that she and Bingley meet only as indifferent acquaintances. “Imprudence or thoughtlessness in money matters would be unpardonable in me.” Jane after her engagement to Bentley, when her father says they will be so generous as always to exceed their income. “Till I have your disposition, your goodness, I can never have your happiness.” Elizabeth to Jane, shortly after Jane’s engagement, when Jane is hoping Elizabeth might someday be as happy. “What did you say of me, that I did not deserve?” Darcy to Elizabeth, speaking of the first time he took it for granted she would accept his proposal. “What can I do to help?” Tourist Trap, by Sue Ann Bowling. Penny is wondering if there is any way she can help Roi to Heal the stricken horse, Token. P.S: That second winter storm (snow mixed with rain) has hit, and the roads are so slick school has been cancelled and the DOT is advising everyone who can to stay off the roads. The engagement of Elizabeth Bennett to Mr. Darcy must have had some rocky spots, especially considering Mrs. Bennett’s partiality (and willingness to express it) toward Lydia and her husband. Ms. Bedford has written a book covering the time between Elizabeth’s acceptance of Darcy and the actual wedding (if it takes place at all) in which the truths of Darcy’s first proposal and those expressed by Lady Catherine de Burgh, and the possible effect of the marriage on Georgiana, come home to both Elizabeth and Darcy. Georgiana cannot bear to hear Wickham’s name; how will she react to having him as a brother-in-law, especially when Mrs. Bennett is so fond of him and completely oblivious to the pain she may be inflicting on others? Mrs. Bennett is wonderfully drawn, and if possible even more difficult than she was in the original book. Elizabeth, Darcy, and Georgiana remain true to their characters also. Mr. Bennett I am not so sure of. In the original book he is if anything relieved to be indebted to a “violent young lover who will carry everything his own way;” in this he is more jealous of his own pride. The story perhaps has a tendency to quote too much from the original Pride and Prejudice, and the ending is a little abrupt. But on the whole it was an enjoyable read. Here are the contexts of the quotes tweeted from @sueannbowling from October 3 though October 9, 2013. All but the last are from Pride and Prejudice, by Jane Austen. “Daughters are never of so much consequence to a father.” Lady Catherine de Burgh, urging Elizabeth to stay longer. “I should infinitely prefer a book.” Mary, responding to Lydia’s description of the fun they had greeting Elizabeth. “You will never be able to make both of them good for any thing.” Elizabeth to Jane, who is trying to think the best of both Darcy and Wickham. “Your profusion makes me saving.” Elizabeth to Jane, saying that Jane’s regret and compassion takes away from her own need for both. “A scheme of which every part promises delight, can never be successful.” Elizabeth, when the proposed pleasure trip to the Lakes must take her away from Jane. “I don’t invite myself to meals empty-handed.” Horse Power, by Sue Ann Bowling. Roi’s explanation for why he is adding things to Amber’s shopping basket and why he is paying for them. 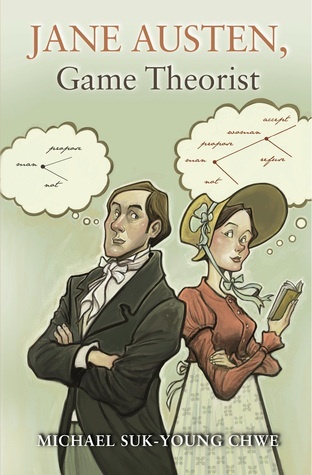 Unlike most of the books and DVD’s I’ve reviewed for the Pride and Prejudice Challenge, Jane Austen, Game Theorist is not an easy, entertainment-oriented read. It is a scholarly book, published by Princeton, complete with a long reference section and an index. Nevertheless, it is a complement to Pride and Prejudice (and Jane Austen’s other books) from a somewhat different point of view than the usual literary approach. I am not a game theorist, and after reading this book I suspect I am a very poor strategist as well, being highly numerate and paying attention to details of my surroundings rather than how other people think and what they want. The book starts with a quick analysis of game theory principles in folk tales such as Br’er Rabbit, which illustrates both some of the pitfalls (thinking the tar baby is sentient) and manipulating the opponent by understanding how he thinks (please don’t throw me in the briar patch.) In fact it appears that most good character-driven fiction has a strong game-theory component, but the author argues that this is particularly true of Jane Austen, and gives numerous examples. One of the things he particularly emphasizes, especially in Pride and Prejudice, is the handicap of the inability to get inside another person’s skin, to see things from their point of view. Certainly neither Darcy nor Elizabeth start out understanding each other. Some of the reasons have more general application: a superior is often clueless about how an inferior (in social standing, chain of command, or merely in his own mind) thinks, simply because he is unable or unwilling to degrade himself to think like the other person. Darcy, a male and in his mind superior to females, cannot understand a female. Lady Catherine is even worse, thinking that her orders will automatically be obeyed. The principles and be and should be expanded to such fields as international relations, though all too often it seems they are not. And this unfortunately seems also to apply to corporate managers and politicians. This morning’s news, for instance, and an interview decrying the game of “chicken” our political leaders are playing. These are contexts of the quotes tweeted from @sueannbowling from September 5 through September 11, 2013. All but the last are from Pride and Prejudice, by Jane Austen. “Adieu to disappointment and spleen.” Elizabeth after the Gardiners have invited her to accompany them on a pleasure tour. “I must have my share in the conversation, if you are speaking of music.” Lady Catherine de Burgh, interrupting a conversation between Elizabeth and Colonel Fitzwilliam. “He likes to have his own way very well.” Col. Fitzwilliam, speaking of Darcy to Elizabeth. “Our habits of expense make us too dependant.” Col Fitzwilliam, explaining why as a younger son he must marry for money. “Disguise of every sort is my abhorrence.” Darcy, justifying the wording of his proposal to Elizabeth at Rosings. “That is a true masterpiece of both understatement and forbearance.” Homecoming, by Sue Ann Bowling. Lai, speaking of Davy’s comment that the people on his planet weren’t very tolerant. When I first saw this title (by Emily Brand) in a BBC catalog my immediate response was, which Mr. Darcy wrote it? After all, the proud, status-conscious male chauvinist Elizabeth starts by despising would hardly have written the same advice as the man whom she eventually married. I was curious enough to get the Kindle edition for my iPad, and decided at once that it had to have been written very early in Pride and Prejudice. Darcy is, frankly, every bit as conceited, proud, and aware of his social position as Elizabeth first imagines him. On the other hand, he has met the Bingleys, actually allows Caroline to write a chapter of advice to women (a chapter which would have had Elizabeth giggling) and is beginning to interfere in Charles’s affairs. Certainly he sees no place for any mixing of classes, and he puts himself very near the top of those not actually royal! In fairness I must say that his advice is not toward seduction as leading to a light affair; his advice is clearly toward finding a wife who will produce the next generation of a noble family. But I cannot help but imagine how he himself would have reacted to much of the advice in this book a year later in his life. “I have certainly meant well through the whole affair.” Mr. Collins, feeling rather put-out (but hardly distraught) by Elizabeth’s refusal. “[Matrimony] was the only honourable provision for the well-educated young woman of small means.” Charlotte, reflecting after she as accepted Mr. Collins’ proposal. “I am not romantic, you know.” Charlotte, defending herself to Elizabeth over accepting Mr. Collins’s proposal after Elizabeth has turned him down. “I only want to set you perfect, and you set yourself against it. Elizabeth to Jane, shortly after Bingley has left. “ How am I even to know it would be wisdom to resist?” Part of Elizabeth’s conversation with her Aunt Gardiner about the lack of wisdom of Elizabeth’s allowing herself to be attracted to Wickham. “Stupid men are the only ones worth knowing, after all.” Elizabeth to her aunt Gardiner, getting ready to set out to visit Charlotte and Mr. Collins. “I commend your school spirit.” Homecoming, by Sue Ann Bowling. Zhaim’s coded message to Xazhar, telling his son to continues harassing Roi. He’s gotten Xazhar to believe that Roi’s presence is a deliberate insult to the school. All but the last quote from @sueannbowling between July 4 and July 10 were from Pride and Prejudice, by Jane Austen. “I hope I never ridicule what is wise or good.” Elizabeth defending herself against the charge of making a joke of everything. “Pay me the compliment of believing what I say.” Elizabeth, trying to convince Mr. Collins that she cannot marry him. “I would rather be paid the compliment of being believed sincere.” Elizabeth is beginning to despair of getting through to Mr. Collins. “Allow me the free use of my understanding on the present occasion.” Mr. Bennett, after he refuses to side with his wife in insisting that Elizabeth marry Mr. Collins. “He never said anything about your being here to me.” Sue Ann Bowling, Homecoming. Coryn, when the school head implies (wrongly) that he took it for granted that Lai had taken Roi. This is a reread rather than a first-time read, but my favorite (so far) of the re-tellings of Pride and Prejudice from a different point of view is Pamela Aidan’s Fitzwilliam Darcy, Gentleman. Pride and Prejudice itself is not entirely from Elizabeth’s point of view, though Jane Austen is famous for never writing a scene with no women present. There are parts that suggest Darcy’s point of view, especially during the period when Elizabeth is nursing her sister at Netherfield. But we are only given hints, and Darcy’s change of heart is never explained. Fitzwilliam Darcy, Gentleman is entirely from Darcy’s point of view. Here we see a Regency gentleman who, as he finally says to Elizabeth, was “given good principles, but left to follow them in pride and conceit.” Here we see him in his natural mileau, torn increasingly between his feeling that Elizabeth offers what he most wants in a wife, and what he sees as his duty to society and his family. We are introduced to new characters, the most important of whom are Darcy’s valet, Fletcher, and an old school friend, Lord Dyfed Brougham. The parts with Elizabeth are amusing, as the same happenings and dialog are presented from entirely different points of view. But the most enjoyable parts of the trilogy, from my point of view, are of Darcy away from Elizabeth. 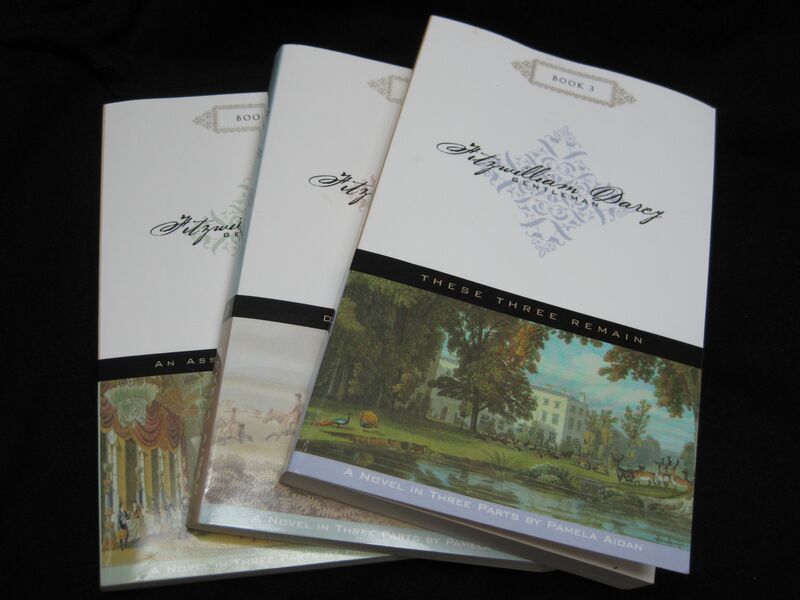 The first book of the trilogy, An Assembly Such as This, for the most part follows Jane Austen’s book. My favorite part, however, is the end, when Darcy is trying to use the enticements of London to distract Bingley from Jane and gets a bit more than he bargained for! Beau Bummel and a scandalous new dance called the waltz are too much for Darcy! The third book of the trilogy, These Three Remain, starts with Darcy and Col. Fitzwilliam’s annual visit to Lady Catherine. Here Darcy agonizes over his relationship with Elizabeth and manages to misinterpret everything she says, leading up to his first, disastrous proposal. I’ve always wondered at the change in Darcy between Rosings and Pemberly. In this book it is natural, though not easy. Initially Darcy is angry, though still obsessed by Elizabeth. It takes a near-entrapment into blackmail and a drunken evening to begin his reformation, but he eventually determines to strive towards “a conduct of his life that would have gained Elizabeth Bennet’s approval,” even though he recognizes that the chances of ever actually making her his wife are slim, if not non-existent. Probably my favorite scene of this third volume is the descent of Lady Catherine de Burgh on Darcy’s town house, with the news that eventually sends him back to Hertfordshire. I am sure there are many books from Darcy’s point of view I have not read, and which I cannot compare with this trilogy. But of those I have read, this is my favorite.